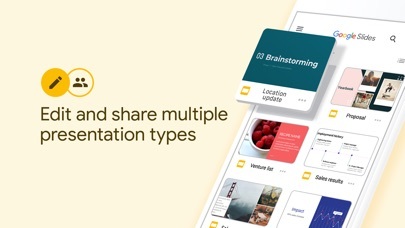 Create, edit, and collaborate with others on presentations from your iPod, iPhone, or iPad with the free Google Slides app. 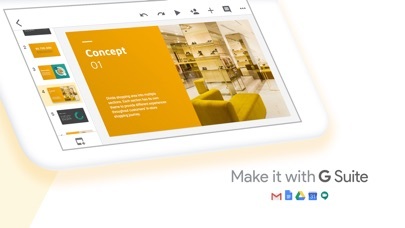 With Google Slides you can: * Create new presentations or edit any that were created on the web or on another device * Share presentations and work together with others in the same presentation at the same time * Get stuff done anytime -- even without an internet connection * Add and rearrange slides, format text and shapes, and more * Present right from your device * Never worry about losing your work -- everything is automatically saved as you type * Present slides to video calls - scheduled meetings will automatically appear * Open, edit, and save PowerPoint files Permissions Notice Camera: This is used for camera mode in video calls and to insert images taken with the camera. Microphone: This is used to transmit audio in video calls. Photos: This is used to access photos under the control of Photos Application to let the users pick images to insert into slides. I like it because I like to log things to look back at later and I can add pictures and mini thoughts. Something I don’t like about it is that if you are uploading a picture from your files on a computer or a phone it goes out of order. Okay, so this is probably because my phone is full of crap, but it took FØREVER for the app to download. So if your phone is full of crap like mine, grab some chips, you’re gonna have to wait a life span. Anyway, I was trying to get on Slides because I left early from school, and I wanted to help my group with our research project. So I went to Drive to get on the project. But Drive told me I had to download another app to get on. And, why? 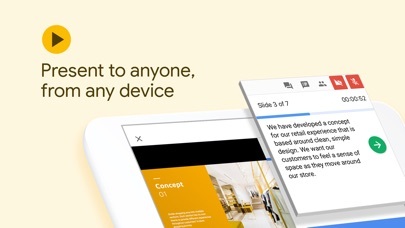 They should all be on Drive instead of having to download all the apps for your documents and PDFs. So(After waiting forever) I got in the app and got on the slide. Some critical reviews said, “Oh it has glitches.” And they might have, but I got in and everything worked. No bugs. I could type, and everything was just fine. This is good! I recommend it. 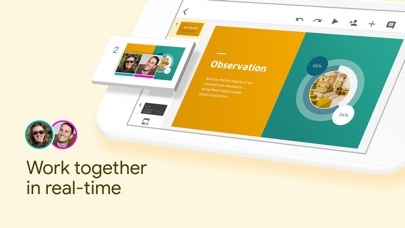 I use this app all the time when I have to make school presentations. Last week, we had to make a presentation on the water cycle and this was the best tool to use. I was able to say what I needed to say in only eight slide! I recommend it so much! 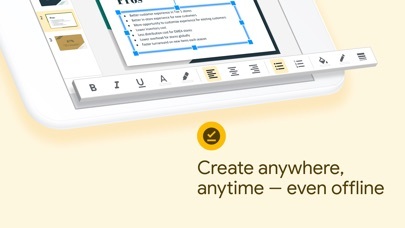 I used google slides to take notes on my iPad at school. It keeps crashing every time I open it. Please fix this!